Another brilliant Grüne work. This is the first volume in the German soccer encyclopedia series that is certainly destined to have folks envious - and wanting more. 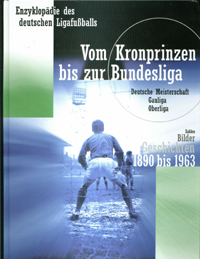 This one gives a year-by-year blow of every German championship season from the 1890s up to the founding of the Bundesliga in 1963. Every champion is portrayed in a photograph, and many of the famous players, clubs and issues are duly profiled in each year.